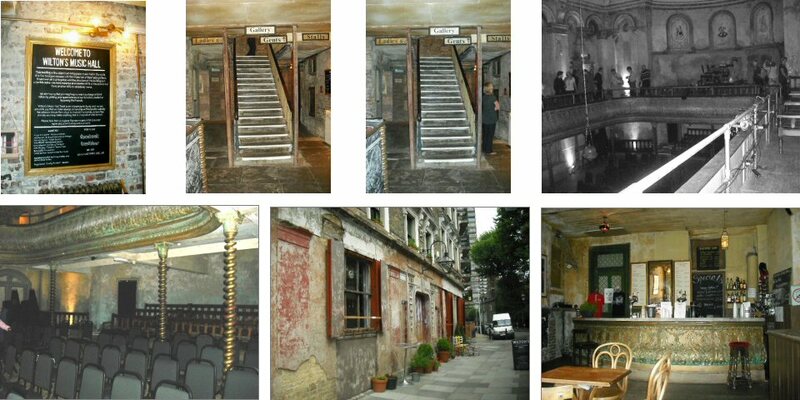 Wilton’s is the oldest surviving Grand Music Hall in the world and started life as the Prince of Denmark pub. It is crumbling away before our very eyes. Recent news that the Trustees who run the venue have had their lottery bid refused makes the situation worse. Without this funding the future of the building is in jeopardy. The Trustees and their volunteers are continuing their fundraising and invite everyone to help raise funds to secure the future of this unique building. The Hall has a colourful history and the building we see today is the result of the rebuilding and expansion of the Prince of Denmark pub. The pub itself was first licensed in 1828 by Matthew Eltham and at the time was nothing more than a three storey public house amid a terrace of smaller houses. Although not a particularly affluent area it didn't have the notorious reputation of nearby Ratcliffe Highway with its nefarious resorts catering for visiting sailors! Eltham's lease was long enough for him to make investments in the property. He was reputedly one of the first publicans to install a mahogany bar counter and fittings. 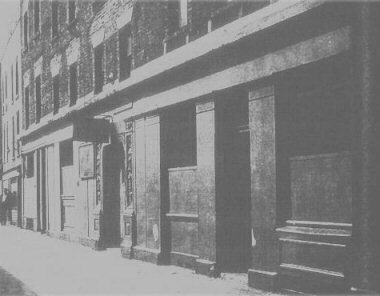 As a result, although the pub retained its old name, it became far better known locally as the Mahogany Bar, a name which was, until quite recent times, still current. By 1839 Eltham held a magistrate's licence for music and dancing in a concert room recently built at the rear of the building. In 1845 his lessee William Collins took advantage of the newly passed Theatres Registration Act of 1843 which allowed him to stage legitimate plays and ballet. Unfortunately the act also put many restrictions upon the proprietor such as not being allowed to open until 5pm and the forbidding of smoking and drinking in the hall. A separate entrance also had to be fitted so that patrons could pass into the hall without having the need to pass through the bar ('distinct from the public house' as the act said). This resulting loss in revenue made trading difficult and within a short time the pretence of running a theatre was dropped. The hall returned to non-variety entertainment with a concert hall licenced as before. In 1850 the building was acquired by John Wilton, who had had some previous concert room experience having chaired the meetings at Dr Johnson's Tavern in Fleet Street. By 1853 he had rebuilt the old saloon as a concert room which boasted a balcony and even some changing rooms for the singers. Shortly after opening, Wilton added a covered bridge from the balcony to a 'supplementary refreshment room' in the pub. Its main purpose was obviously to facilitate drink sales. Buoyed by success Wilton set about building a hall on a grand scale which would be comparable to Morton's Canterbury Hall in Lambeth. It is this new hall that we see today. Jacob Maggs who hailed from Wilton's home town of Bath. The new hall was to be 75ft long and 40ft wide with a balcony supported on three sides by cast iron columns of a curious helical-spiral design. There was a servery link between the pub and the hall near to the stage end. The lighting was provided by a gas 'sunburner'. The foundation stone was laid by Mrs Ellen Wilton in 1858 which can still be seen inside the hall to this day. The opening night was on Monday March 28th 1859 and the announcement in the newspaper advertised a full bill with 'Talented and Powerful Company of Vocalists' including Messrs, Dempsey and McGuiness, The Popular Comic Singers and Dancers. In 1877, a refurbishment was announced which would have enlarged the stage and rearranged some of the balcony boxes. While work was in progress, the hall suffered a disastrous fire resulting in only the outside walls, the iron columns and part of the balcony surviving. There was also some minor damage to the rear of the pub as well. The hall was rebuilt along similar lines and reopened by landlord Mr Hodgkinson in September 1878. Despite the rebuilding the future of the hall was in doubt. It was the 1878 Metropolis Management Act that gave the Metropolitan Board of Works new powers to make regulations for the protection against fire of 'places of public resort' and require proprietors of theatres and music halls to remedy structural defects. Inevitably, the stringent safety demands of the Board of Works caught up with Wilton's and the work required to obtain a 'certificate of suitability' was just too great. Wilton's Music Hall closed in 1880. The following years saw the building being used by the London Weslyan Mission until the 1950's when it became a warehouse for sorting rags. By 1963 the whole area was earmarked for compulsory purchase and demolition. 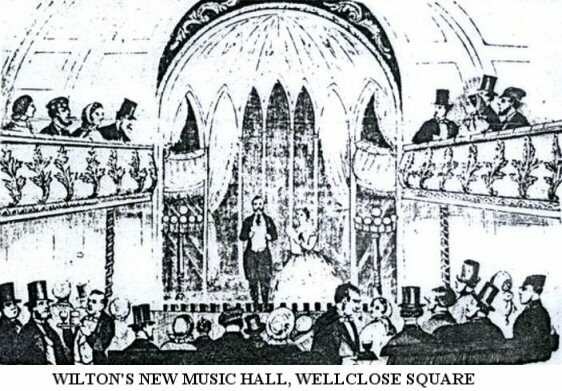 It was the newly formed British Music Hall Society backed by, amongst others Sir John Betjeman that secured an undertaking by the local authority to look into retaining the building. Wilton's is now owned and operated by the Wilton’s Music Hall Trust.